Star Bharat, the Hindi GEC channel from Star India, launched a huge promotional campaign as a run-up to the wedding ceremony of Nimki, the lead character of one its shows Nimki Mukhiya. The channel wanted to ensure that all Nimki fans and followers – responsible for making her TV’s favourite character – were part of her wedding.They were personally invited for the event. 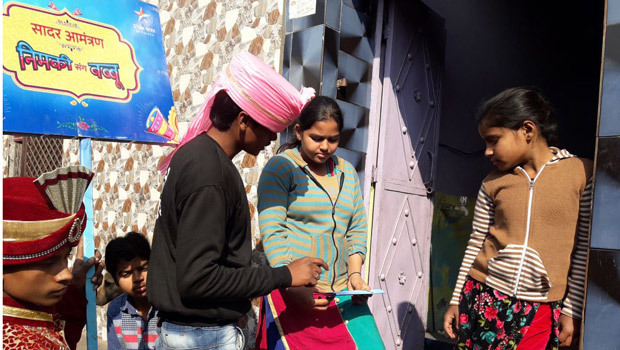 Star Bharat implemented a 360-degree promotional campaign through on-ground activation and ambient media, reaching out to 26 cities across Uttar Pradesh, Uttarakhand, Madhya Pradesh and Chhattisgarh over a period of 10 days and used digital and radio to amplify the reach. The on-ground activities started with the promoters dressed as ‘ladkiwalas’ arriving in style led by a procession of ‘band baaja’ with bandwalas playing the signature show tune. The ladkiwalas personally invited families with a wedding invitation card going door to door and reached out to 1.4 million viewers across cities. With the wedding season already in full swing in North India, the excitement in these cities only grew manifold. Adding to the wedding feel, multiple bus shelters were decorated like shaadimandaps in five cities – Kanpur, Lucknow, Allahabad, Agra and Gorakhpur. To create the ambience of an Indian wedding, the mandaps had musicians playing wedding tunes on shehnai. The ladkiwalas gave out wedding invitation cards thus engaging with almost 50,000 commuters at these mandaps. Overall, in the period leading up to the wedding, Star Bharat claims to have reached out to 2.42 million fans directly and indirectly through this innovative campaign across ambient media and on ground. This campaign was further amplified on radio across UP and MP to invite listeners to this anokhishaadi. Star Bharat partnered with seven leading Hindi FM radio stations, reaching out to 200+ towns to ensure that all the families across these markets were invited to the much-awaited wedding celebrations.